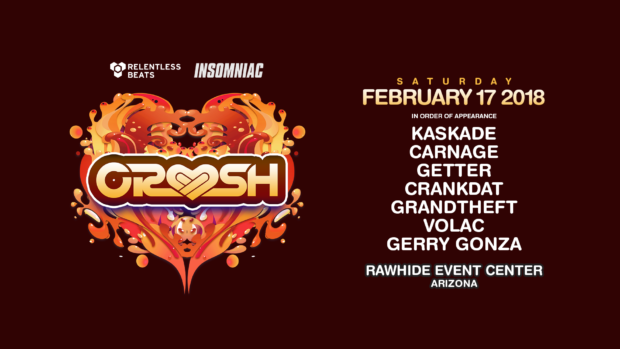 The 9th Annual Crush Arizona is returning February 17, 2018, at Rawhide Event Center... and I couldn’t be more excited! Relentless Beats and Insomniac Events always throw an amazing event, so I can’t wait for this one and all that’s in store – as it’s been dubbed Arizona’s longest standing EDM festival . The event will feature Kaskade, Carnage, Getter, Crankdat, Grandtheft, Volac, Gerry Gonza and more!! General Admission passes are on sale for $70. VIP passes, with access to preferred VIP viewing deck, premium restrooms, commemorative lanyard, express entry and passed deserts are available starting at $115. VIP is 21+ area. Purchase tickets online at www.relentlessbeats.com. Crush Arizona is an 18 and over event.